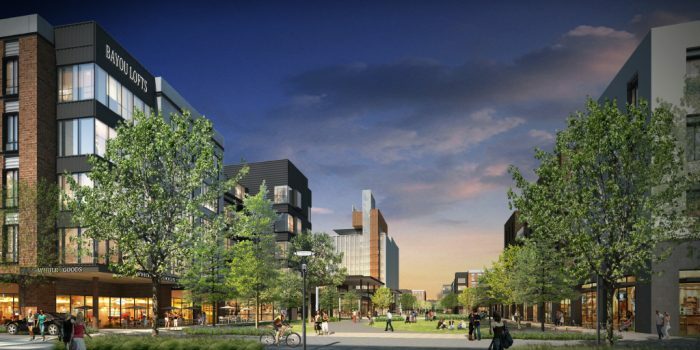 The East End District has helped change the image of the East End, once known for graffiti, illegal dumping, and overgrown and neglected properties. Eradicating these negative influences and replacing them with safer trails, green spaces, and colorful murals inspired GEEMD to develop a unique project called “Blight to Beauty” along J W Peavy, one of the most heavily trashed streets in the East End. Phase 1 400 YES Prep East End students and Houston City Council Member Robert Gallegos and his staff on May 25, 2017,distributed door-hangers to 2,500 Magnolia Park homes, explaining the City of Houston’s heavy trash pick-up schedule in English and Spanish. Students also de-littered 214 blocks in the area, picking up trash, plastic bottles, cans and other debris. Phase 2 300 veteran and student volunteers cut back a 15-foot deep swath of overgrown foliage along 1/3 linear mile of JW Peavy to reveal an abandoned railroad spur; converted the spur to a walking trail with 48 yards of mulch created on-site from the tree and shrub waste; cleaned and primed a 260-foot concrete wall on JW Peavy in preparation for mural art work; de-littered the project area between Hidalgo Park and 75th Street. 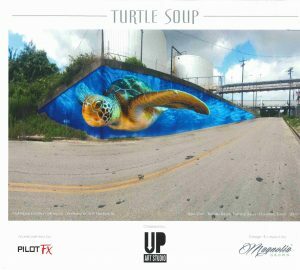 Phase 3 A water-life mural painted by Pilot FX with UP Art Studio will soon be created on the wall to deter graffiti tagging. 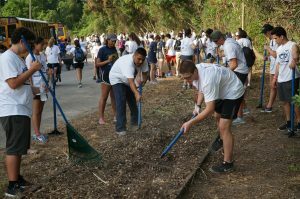 “Blight to Beauty” benefits the Magnolia Park neighborhood by beautifying a long-time dumping area with a new, mulched trail between Hidalgo Park and 75th Street, a major access route for runners, cyclists, and walkers. The project will reduce the dumping of tires, bags of household trash, and dead animals, which will also reduce or eliminate problems with standing water, mosquitoes, and rodents. 48 yards of mulch were produced on-site during the project and used as the trail bed material. 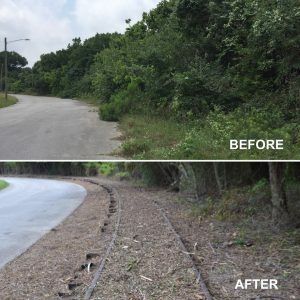 Eliminating the heavy shrub overgrowth and tree waste, and simultaneously raising the tree canopy, also resulted in cleaner streetscape, with less opportunity for bagged trash and dead animals to accumulate. Mission Continues, Houston’s Fifth Platoon, led by U.S. Army veteran Monique Rodriguez, focuses on quality of life improvements in the East End, with empowerment opportunities for its veteran members to continue to serve through transforming projects that connect them to their community and inspire others to serve. HOBY, the Hugh O’Brian Youth leadership program, provides opportunities for local and international high school students to participate in unique leadership training and service-learning projects. 200 students and the HOBY leadership team were visiting Houston on the second weekend of “Blight to Beauty”, and joined the efforts on J.W. Peavy as their weekend service project. YES Prep East End, a public charter school, educates more than 900 students in 6th to 12th grade and believes in giving back to its neighborhood, the East End community, and the City through service hours. 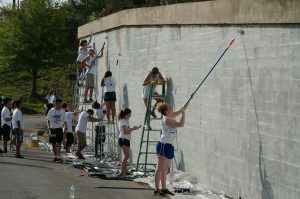 All students have opportunities to volunteer and give back to the community through a variety of service work and unique projects. Keep Houston Beautiful provided tools and supplies for “Blight to Beauty”, including gloves, trash bags, and litter sticks. UP Art Studio facilitates art projects for urban and contemporary artists, communities, and corporations, here in Houston and around the world, with a motto: “civic pride through civic art”. Pilot FX is the local artist with UP Art Studio who designed and painted the stunning water life mural on the J.W. Peavy wall. He was inspired by the Buffalo Bayou waterway just a block away from the project location. City of Houston Department of Neighborhoods and Mayor’s Citizen Assistance liaison Maria Bolanos were GEEMD’s partners in defining the outcomes of the “Blight to Beauty” project so that it benefits the Magnolia Park neighborhood by reducing dumping and littering, provides safer access to Hidalgo Park along a mulched walking trail via JW Peavy, and beautifies the neighborhood with mural art. Ms. Bolanos also provided detailed maps for the YES Prep students to follow when distributing heavy trash door hangers. City of Houston Solid Waste Department provided a roll off container for the YES Prep students de-littering in the Magnolia Park neighborhood and Hidalgo Park. Houston City Council Member Robert Gallegos printed more than 2,500 door hangers in English and Spanish that were distributed by YES Prep students on May 25, 2017 to homes in Magnolia Park. CM Gallegos and his staff canvassed the neighborhood with the students to hang the door tags and del-litter the area. HPD and Harris County Precinct 6 Constable provided patrol officers to ensure the safety of all the participants during all phases of the project. Officers also patrolled the neighborhood during the door tag hanging on May 25 to control vehicle traffic and watch for stray dogs. NuStar Energy, L.P.- One of the largest independent liquids terminal and pipeline operators in the United States, with an asphalt terminal storage facility located on the ship channel near J.W. Peavy. NuStar contributed staff and a bobcat to help move the mulch. They also provided funding for the mural art. Shell Oil Corporation– One of the world’s largest energy and petrochemical companies, Shell leases several asphalt storage tanks, located just above the water-life mural wall, from NuStar Energy. Shell provided funding for the mural art. Frost Bank provided bottle water and snacks for the YES Prep students and faculty. Space City Credit Union provided hand sanitizers for the event. J.W. Peavy and the area near Hidalgo Park in the Magnolia Park neighborhood continues to be monitored for illegal dumping by the East End District’s on-site cameras and observation by the staff and litter crew. The project area will be further developed with the addition of benches, shade trees, and trash receptacles to enhance the walking path and the mural area. 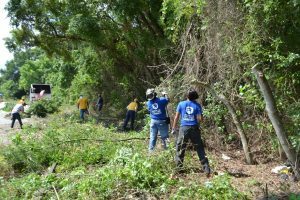 The management district schedules community clean ups throughout the year to de-litter the streets leading to the park and new trail on J.W. Peavy.